This Monarch caterpillar, hanging around today in the gardens of TWWIAGE, is enjoying a nice snack of milkweed. In fact, this caterpillar will have to do more than just nibble on this leaf, it will have to consume a huge amount of milkweed in order to bulk up its body mass prior to pupation. During the two weeks the caterpillar takes to go through five instars of growth it can increase its original body weight up to 2000 times. Apparently, a Monarch caterpillar can chomp through one milkweed leaf in under 4 minutes. That's a lot of milkweed. And a lot of frass, or caterpillar poop to the layperson. (Ha! I just typed the word poop. Titter, titter.) I love nature. With trying to keep up in the vineyard, suckering and stuffing shoots, and all that, I am a bit behind on my reading. Last night, trying to get in a bit of reading before I fell asleep, I noticed this article in the April 13th issue of Time. When Pope Francis visits the United States in September he is going to use a very special silver chalice at a mass in New York (not the mass in Washington D.C. at which the Pope will canonize Blessed Junípero Serra). Crafted from donations of silver, by silversmith Adrián Pallarols, the design of the chalice will include quite a bit of symbolism, like; stylised leaves for the Garden of Eden; columns and arches representing St. Patrick's Cathedral, NYC; and a map of the United States as the host country. 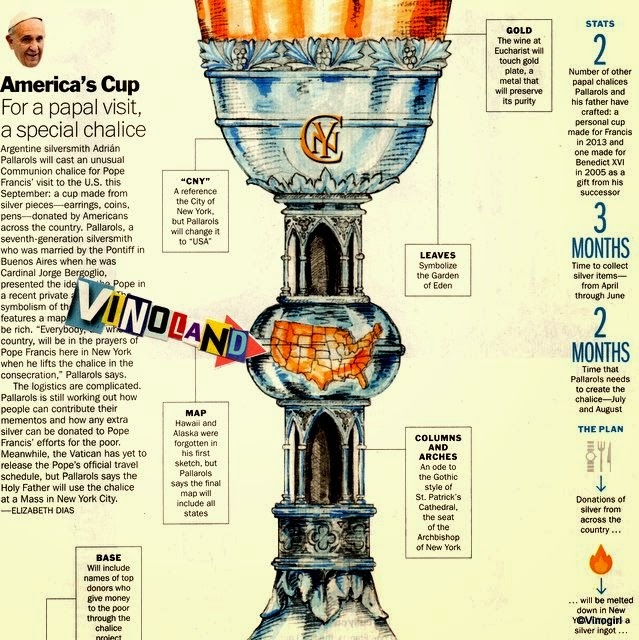 In Adrián's first sketch of the chalice design he forgot to include the non-contiguous states of Alaska and Hawaii. An easy oversight, I suppose, and easily amended. But, hang on a minute, there is still one glaring omission; Señor Pallarols forgot to include Vinoland. What? It's okay folks, don't panic, I've added Vinoland myself, all fixed. One question still remains to be answered though. What wine will be in the chalice? Vinomaker said it most likely would be Manischewitz. But, (rolling my eyes), I'm thinking it should be something from Napa. Illustration courtesy of Time Magazine. Get Gott? Well, only if one is partial to overly oaked wine. I was hoping this Joel Gott, 2012 Grenache would pair nicely with a spicy Italian sausage pizza that I made for dinner last night: the relatively low alcohol, 13.9%, seemed promising (perhaps making this a food-friendly wine), but alas, no. All the nice spiciness and raspberry-goodness that I expect in a Grenache just weren't there, hate when that happens. It's a shame because I have had other vintages of this wine, and other wines from this producer, that have definitely been more palatable - and less oaky. Also, 2012 was supposed to be one of those vintages in which it was almost impossible to make a bad wine. I did say almost. Happy St. George's Day, 2015. As England means to me. Ross Parker. Happy St. George's Day to my family, friends, and anyone who loves England as much as I do. La Malagueña and a little Mi Sueño. I like going to christenings (and the parties that follow) because everyone is always so happy. The christening I attended yesterday, that of the daughter of a good friend of Vinomaker's, was indeed a very happy event. Lots of kids, family, good food and great wine all mixed up together on a sunny Saturday afternoon. 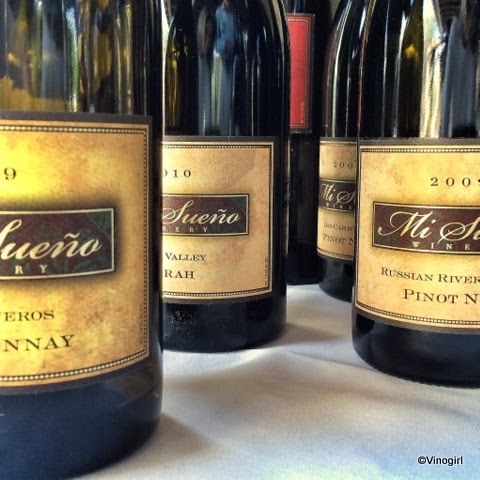 A killer chile relleno (and best refried beans, ever) paired well with a Mi Sueño, 2011 El Llano (Napa Valley AVA). I also tried several other wines, including Baldacci, Longfellow, Noemi (all made by winemaker Rolando Herrera), but the El Llano was definitely my favourite. Entertainment was provided by a nine piece Mariachi band. The combination of mariachi music, Mexican food and warm sunshine made me feel like I was on my holidays. I was really having a good time, so much so that I didn't even mind being serenaded by the lead singer who sang a very sweet, melodious rendition of La Malagueña right at me. More than a little awkward, but weirdly wonderful nonetheless. 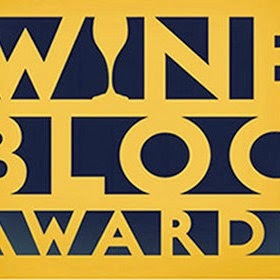 It's been three years since I have even given a thought to the 'Wine Blog Awards'. But just yesterday, the nice folks over at award HQ sent me an email with instructions on how to nominate wine bloggers for the 2015 awards. There are seven categories that you can choose from to submit a blog for consideration; a sort of virtual pat on the back in recognition of the effort they put into educating, amusing, enlightening and, sometimes, infuriating we the readers. And often for no financial compensation, not a penny. So I did, I nominated four of my favourite blogs. To me it is all just a bit of fun, but by nominating one blogger I just might make their day. I know I felt pretty good the two different times I was nominated. So nominate your favourite blog today. Vote for me, if you have to. But hurry, voting closes at midnight on the 22nd of April. Yup, California is in desperate need of water as the past three winters have been particularly dry. Television and radio news agencies are reporting, on a daily basis now, stories about how dire the water shortage is becoming, the need for water conservation and the new restrictions being enforced. And the fines the average California homeowner will incur if they are caught wasting this precious resource, (neighbours are being encouraged to snitch on one another to the authorities). The water situation is bad, but there have been worse droughts in California's history. Of course, there are more people living in California than ever before and with population growth comes the need for more food to be produced. California needs to eat. Some little sound bites I have heard on the news include; Agriculture is said to be about 2% of the California economy, but uses some 80% of all the water; It takes one gallon of water to produce one almond; It takes three times as much water to grow one acre of alfalfa (and other forage crops) than it does to grow one acre of rice; California produces more rice than China; Alfalfa production in California is subsidised so that farmers can produce alfalfa cheaply to sell to China for cattle feed. Now, I don't know how much of what is reported is factual, but stories like these give the average, thirsty California some food for thought. The rain will come, eventually. But in the meantime, when life gives you raisins, make Amarone. 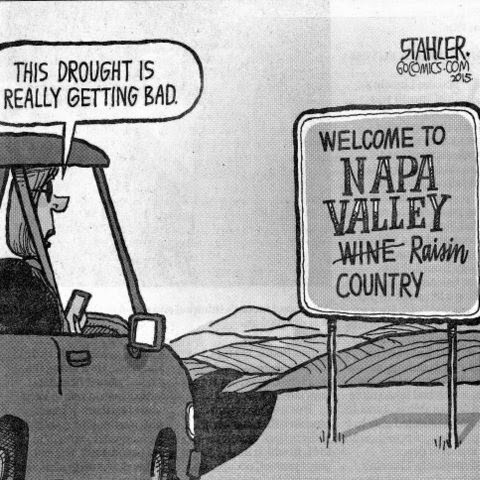 Cartoon courtesy of the Napa Valley Register. It is hard to tell from this photograph exactly what is going on in the head of this young Pinot grigio vine, it's all a bit of a mess - and that's the point. The vines have gotten off to a great start for 2015, but that means an awful lot of adventitious buds have developed in places I didn't intend on them appearing. Hate when that happens. These adventitious buds, which generally form on older wood, are sometimes called non-count shoots. Humph, well they count for something because they generally mean a bit more extra work for me in the vineyard. So that is what I did today, thinned out the heads of the Pinot grigio (and suckered the trunks). One should generally start to perform shoot-thinning when shoots are about 4 inches long, waiting any longer means that the base of these extra shoots may have started to lignify making removal a little more difficult. Canopy management is very important, even at this early stage in the year, as it allows more sulphur (spray) to penetrate the canopy to safeguard against powdery mildew infection. So a sunny, California Sunday afternoon was spent thinning and clearing out heads. Next up, the Syrah vines. A neighbour has decided to plant vines in two former horse paddocks in front of her house. The two plots had been ripped with a bulldozer last autumn and since then they have been left, over winter, to the machinations of the weeds. The wild oats, barley, mustard and wild radish were shoulder high this time last week, but that was before the goats arrived - about 50 of them. The weeds are now stubble. Napa Goats is a business that rents out domestic goats (Capra aegagrus hircus) to folks in need of vegetation control. I want to hire the goats to nibble away at the Himalayan blackberries (Rubus armeniacus) that are threatening to take over Vinoland. I swear, along with cockroaches and Twinkies, blackberry plants would survive a nuclear apocalypse. I need those goats. However, Vinomaker is worried that the goats would escape into the vineyard. But I'm thinking that if I did hire the goats and they somehow got loose in the vineyard Vinodog 2, with her Border Collie blood, would, at long last, be gainfully employed like the Napa Goats. Happy California Poppy Day, 2015. The California Poppy (Eschscholzia californica) was named in 1816 by naturalist Adelbert Von Chamisso, who upon sailing into San Francisco Bay found the surrounding California hills covered in golden flowers. Proclaimed the state flower in 1903 'California Poppy Day' is celebrated every April 6th, but I bet a lot of people don't know that. I'm going to be thinking nice flowery-thoughts all day as I wish as many people as possible, Happy California Poppy Day! Eggs for breakfast! Yup, got up this morning and the first thing I did was stuff a Cadbury Creme Egg into my mouth. Then it started to rain, so I ate another two. Lent seemed awfully long this year. Peeking down into this milk carton one can see a baby Pinot grigio vine doing what it does best, reaching up for the sun and growing. Planted last season, this young vine is replacing a weak vine that just didn't make it; a rebirth of sorts, apropos of the season methinks. Everywhere is so pretty right now, in part due to the fact that there are so many different plants happily blooming away. And there is also new and healthy looking growth on trees, shrubs and, of course, grapevines. I love spring, it's my favourite season. I may have mentioned this before, but I just love wildflowers (and most weeds). A current favourite wildflower of mine is the Intermediate Fiddleneck (Amsinckia menziesli var. intermedia) which is blooming, in quite dramatic fashion, over at the off leash dog park where I sometimes take Vinodog 2 for a bit of a treat (though she really doesn't like the car ride over there). Situated on the west side of the valley the dog park is surrounded by vineyards and even though every single last vineyard in the valley has been mowed by now, on the dog park side of one particular vineyard there are lots of fiddlenecks growing unfettered. I just love the deep, golden-yellow of the fiddleneck's little trumpet-shaped flowers (and the spiky stems and the fuzzy buds), the blooms are very conspicuous against a verdant expanse of wild barley.